In 2013 and 2014 the Rev. Holt left the village and the Rev. Stacey came to be the new vicar. This seems an appropriate time to reflect on its conducts, priests and Vicars. Eton Wick had no church building until 1866/7 when St. Johns was built in Sheepcote. Previously services (but not the Sacraments) were held in the school room at the top of the walk, but of course that building did not exist until 1840. We are told of earlier services in a farm building, but l have no details. The Eton church of St. Johns the Evangelist was built mid 1850s, but not until 1875 would Eton or Eton Wick be a parish independent of the 'College', where the College Chapel continued to be the Parish Church and as such provided conducts for the services in town and village. Until 1875 the provost was responsible for the spiritual care of the communities and as such delegated the care to his conducts. In that year the town church became the parish church and town and village were served by a vicar and a priest respectively. 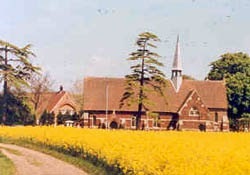 In 1972 the village's became the Parish church, and it was during the time of vicar Rev Johnson who for personal reasons did not choose to leave the town vicarage for the village. Excluding the early conducts we have listed, to be best of our knowledge, all the curates since 1875 when the 'Parish Church' was the Church of St. John the Evangelist (Eton). Parish magazines from which this information was collated were not published from March 1917 due to war-time shortages. Started again in January 1920. This article was first published in Our Village, Eton Wick's own village magazine.